Battery life on today’s smartphones is one of their least impressive features. While things have indeed improved in the past few months, heavy users are generally forced to carry a spare AC charger/battery wherever they go so that they don’t come across a situation where they need to make/take an important call and it turns out that their LTE smartphone is out of juice. Keeping that in mind, it is important that you keep track of how much battery life is left on your device so that you can accordingly adjust your use of it. The built-in dynamic battery icon that comes built-in with Android doesn’t give an accurate view of current battery status as it takes big jumps after every 20-30%. That’s where ChargeBar comes in. Check it out after the jump! Developed by Thomas Barrasso, ChargeBar is a useful battery bar (inspired by MIUI’s lock screen battery bar) which displays the exact amount of charge left in your battery. It does this in the form of a completely customizable thin line. 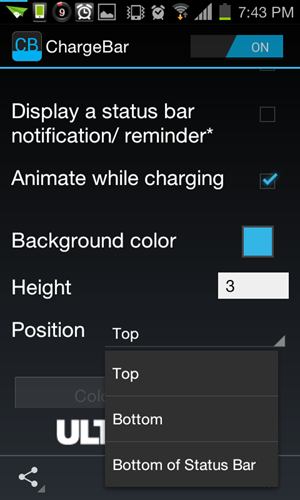 Launching the app reveals its only screen – a menu full of settings that let you customize your ChargeBar. From functional settings like starting on boot, hide in lock screen / full-screen apps to cosmetic ones like the ChargeBar’s color, height and position. 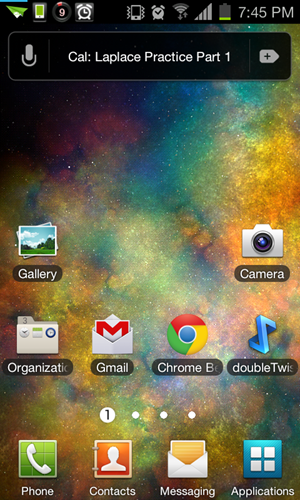 By default, the color is the same shade of blue as the Holo theme in Android 4.0 Ice Cream Sandwich, but it can be changed to any color of your choice. Similarly, the default height of the bar is a comfortable 3 pixels and can be changed as well. Lastly, the app gives you the option to display the bar above/below the notifications bar or at the very bottom of your display. ChargeBar is highly recommended for those of you who like to stay on top of your battery percentage. It’s a free app and can be downloaded from here [Google Play]. Be sure to tell us what you think of ChargeBar by leaving a comment over on our Facebook and Google+ page!